Voted Online Estate Agent of the year, with local property experts supporting you at every step of your sale, you can trust House Simple to sell or find the right property for you. Save thousands with House Simple with the no sale, no fee policy as well as free valuation visits that include professional photography and floor plans. And, by comparing the most affordable prices from some of the top housing portals available you can rest assured that you’re finding the most suitable properties with all your ideal features for an affordable price. By using House Simple you not only gain access to affordable prices and the best properties available for your budget, you can also enjoy the convenience of 24/7 access to manage your account allowing you to update your listing any time, any where as well as management of sale through to completion by House Simple’s knowledgeable experts. If you’re looking to sell your house, do it easily with House Simple’s ‘selling’ service. Advertise your property on over 500 of the most popular housing portals like Rightmove and Zoopla for one small, affordable fee and no additional charges- even if your property doesn’t sell. Pay just £995 to advertise your property online and gain access to a whole host of other benefits including a dedicated agent, a personal property hub, a ‘for sale’ board, professional photos, ads on some of the main property websites, professional negotiation and floorplans, longer opening hours and sales progression. Other optional services included in your selling fee include hosted viewings, mortgage brokering, conveyancing, EPC and Scottish home reports. Book your free home valuation today and get your property listed on House Simple as soon as possible where it’s guaranteed to sell. If you’re looking to let your property out you can gain access to this service at House Simple too. Pay as you go from just £29 per week or pay upfront from £95 to let your house, apartment or flat and benefit from a property expert, the ability to update your listing any time, anywhere and instant viewings, feedbacks and offers. To begin the letting process first arrange a home visit in just a few minutes where an experienced Local Assessor will take professional photographs and floorplans. You’ll then be assigned a property expert who’ll be with you for the entire process; keeping you updated at every stage of the letting process as well as providing regular property performance reviews. The House Simple online system allows you to review and update your listing at any time, from anywhere. And once you’re happy, your listing will go live across the huge network of 500+ websites including Rightmove and Zoopla. Viewing requests, viewer feedback and offers will be sent automatically to your account, and you’ll also receive a text alert to update you. 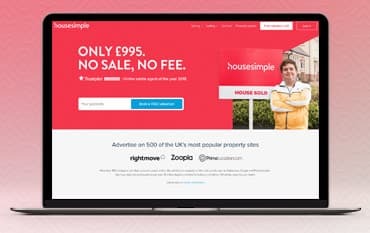 House Simple is a huge property advertising network that boasts over 10 million buyers and tenants making a combined 180 million searches per month. More than 95% of house buyers start their property search online which is why House Simple use their impeccable expertise and years of experience to help you buy and sell the right properties through main portals such as Rightmove, Zoopla and Prime Location, all online. With free home visits for valuations, photos and floorplans, your own property expert and instant viewings, feedback and offers, you can expect nothing but the best from House Simple. And, when you use a discount code from us during your house search, you can enjoy great savings on all these services too.